The State Information Security Authority in cooperation with the "Musine Kokalari" Museum and the Wikimedians of Albanian Language UG organized in Gjirokastra "Gjirokastra Reads Musine" activity. In remembrance of the multidimensional figure of Musine Kokalari, the political and cultural activist and the Albanian writer. The event had a great coverage of media including The Voice of America. The members of Wikimedia Community Usergroup Albania, the community of Open Labs Hackerspace and the Albanian National Film Center institution signed a Memorandum of Understanding under the terms of which the partners will further collaborate to publish multimedia materials and other related information about the Albanian film industry. This materials will be published on Wikipedia, Wikidata, Wiki Commons and other similar platforms with the goal of empowering the public domain. This memorandum will help the partners to achieve their common goals where the main objective is to improve and enrich the online information about the Albanian cinematography. The 14th International Digital Curation Conference was held in Australia from 4 - 7 February 2019, at The University of Melbourne. The theme of the conference was 'Collaborations and Partnerships: addressing the big digital challenges together'. Wikimedia Australia was represented at IDCC19 by Dr Thomas Shafee, who presented a session titled: Wikipedia-integrated academic journals: Ideal platforms for outreach and public communication. The goals of attendance included to ensure that the International Digital Curation community (archivist, curator, librarian and academic) is kept aware of the main relevant developments in Wikimedia projects. During attendance at the initial talks, I realised that Wikidata and WikiJournals would be the primary interest for the audience, so my live demonstration prioritized the Wikidata aspects, and the talk prioritized WikiJournals. The live demonstration of Wikipedia, Commons and Wikidata went very smoothly, with a range of examples used from science, law, and history topics. The talk was well-received with questions afterwards about how Wikipedia has changed over the past 18 years. I also assisted a group of 8 people with signing up for accounts and making their first Wikidata edits during a teabreak. From 15 June to 15 November 2018 we organised together with various partners the photo contest Wiki Loves Heritage as part of the European Year of Cultural Heritage 2018. As part of the contest we asked the public to take photos of all kinds of Belgian heritage that exists. Eligible in the contest was not only the immovable heritage, but also the movable heritage (like museum pieces) and immaterial heritage (like traditions and more). Together with the photo contest we also stimulated our partners to donate images to Wikimedia Commons. After the contest period ended a national jury selected the five winning photos. See for the results the Belgian winning photos in large format and the Jury report of the national jury. Within the photo contest of Wiki Loves Heritage, the Flemish government organised a Flemish jury and winners, in East Flanders the local government organised a local jury and winners, and the Architecture Archive Flanders organised a contest around the architect Léon Stynen. See for the Flemish results the Flemish winning photos in large format and the Jury report of the Flemish jury. On 18 December 2018 we organised the award ceremony to announce the winning photos of the national jury. On 23 February 2019 the Flemish award ceremony took place to announce the Flemish winning photos. The photo contest created more awareness about the importance of cultural heritage visible online and we are happy with the results. Therefore we started with the preparations to organise in 2019 another Wiki Loves Heritage photo contest. The scope will be the same, but as we noticed that 85% of the uploaded images were from immovable heritage, we will put the focus in our communication on movable heritage. From November 2018 to February 2019 the King Baudouin Foundation in Brussels had a Wikipedian in Residence to open up their collection. The Heritage Fund of the King Baudouin Foundation acquires works of art and literature that are considered as important Belgian heritage and gives these works in permanent loan to museums. They consider it important to make these works available to an as large as possible public. Data on over 3000 works of art from its collection from the Heritage Fund has been published on Wikidata and available photos of these artworks have been uploaded onto Wikimedia Commons. In this way important Belgian heritage is available online so it can become better known among the general public. Diego Barbosa da Silva, from the Brazilian National Archives. "I am from the Brazilian National Archives, and we are moving to Wikipedia and Commons to share images of documents preserved in our collection . . . What should we do?" This message was left on the "Talk to Us" page on Wikipedia in Portuguese, on October 16, 2017. The editor was Arquivonacionalbrasil. As I responded to the user's talk page, I soon realized I was chatting with the director of one of the largest GLAM institutions in Brazil, Diego Barbosa da Silva. The launching moment of the GLAM-Wiki initiative with the Brazilian National Archives, a success case of partnership between a cultural institution and Wikimedia projects, was rather unexpected. Wikimedians are normally first movers in these partnerships. The vision that led Diego Barbosa da Silva reach out to Wikimedians and the development of the GLAM-Wiki initiative are topics of the following interview. A striking feature of this GLAM-Wiki initiative is the very high use rate of images, reaching 20-25 million views per month, Diego Barbosa da Silva claims. He also notes how impactful this initiative has been for the team at the National Archives, as through the interaction with Wikimedians team members have taken up to their daily work routine some principles of Wikimedia projects, particularly collaborative curation and description. Unfortunately, the team that was responsible for the GLAM-Wiki initiative has been dismantled in the National Archives, in the context of recent changes in the Brazilian government. According to Diego Barbosa da Silva, this was "a great administrative misconception", as it fails to recognize the social importance of disseminating cultural collection on Wikimedia projects. Wikimedians from Brazil have mobilized to revert the dismantling of the team. Answers were posted on a shared document in Portuguese on February 14. The Golden Law, the law that abolished slavery in Brazil. High-resolution document made available by the Brazilian National Archives. Could you please describe your roles and responsibilities in the context of the GLAMWiki Initiative with the Brazilian National Archives? The Brazilian National Archives GLAM-Wiki project began when I was in the General Director of the National Archives, in 2017. During this period we made several changes in the institution in all areas, spanning from documentation management, preservation and technical processing to accessibility and dissemination. In the scope of the latter, it is worth highlighting the creation of new work teams such as Heritage Education and Social Media Dissemination, which was responsible for elaborating content to spread the collection of the National Archives in institutional pages and profiles --most of which had just been created--, including Instagram, Pinterest, Flickr, MixCloud, Twitter, Facebook and Youtube, as well as for coordinating within the realm of the National Archives the GLAM-Wiki project we had launched. After my term as the General Director, and due to my great interest in making the collection available quickly and accessible to many people on Wikipedia, I decided to join the Social Media Dissemination team. I became responsible for selecting the collection that will be made available, checking the metadata, sending them to be uploaded to Wikimedia Commons and in the spare time I still have enjoyed editing Wikipedia, mostly active in contributing to entries where the images we have uploaded were used. The first move to launch the partnership with the Wikimedia community came from your side. This is unusual, as normally Wikimedians are the first movers. What motivated you to get involved with the Wikimedia projects? What were the expectations? The National Archives has had for 23 years the same General Director, and this has prevented more dynamic actions. When I became general director in 2017, in a very unusual way, I tried in the short time I had to produce a large number of changes. The National Archives had turned itself onward for several years, whereas other organizations such as the National Library and the Casa de Rui Barbosa Foundation had implemented important projects, respectively the Brasiliana Fotográfica and the coordination of the archives from within the National Council of Cultural Policy. We have tried, therefore, to put into practice many projects and to resume others that were forgotten so that the National Archives could better fulfill its mission. We evaluated that we should put more emphasis precisely in the area of dissemination, but without abandoning the other areas of the institution. Dissemination would become strategic, since it would broaden the impact of the National Archives, contributing to social acknowledgment of the organization. In doing so we sought to attract more government resources to ensure preservation of the collection and to improve archival management. The latter is responsible for improving how we classify and curate documents of the Federal Government and for making sure we are able to have a lasting impact. That's why we have invested in publicizing the National Archives and so we took the initiative to work with social media and Wikimedia Commons was an obvious pick as, in addition to expanding the number of users, we sought to diversify, reaching the most varied age groups, regions of the country and the world, and social classes. The National Archives needed to project itself nationally and the best way to leave Rio de Janeiro, where our headquarters are, was to expand the availability of its collection on the Internet. We also envisioned that having our collection on Wikimedia Commons would have a real impact on the quality of Brazilian education, as the availability of content also meant the use on Wikipedia, which we know is the largest hub of knowledge of humanity. Could you please describe what the Brazilian National Archives are, and why do you think this institution and Wikimedia projects belong together? The National Archives was created in 1838, by Decree No. 2, from January 2, signed by Pedro de Araújo Lima. It was envisioned in the first Brazilian Constitution, in 1824. Nowadays, it has two offices, Rio de Janeiro and Brasília, and keeps millions of textual documents (which if stacked would be 55 kilometers long); 1,740 million photographs and negatives; 200 photographic albums, 4 thousand cartoon books, 3 thousand posters, a thousand postcards, 600 drawings and engravings, thousands of maps, films and audio-visual and sound records on a wide range of media. We have observed over time that archival institutions were much more important than what we had imagined --especially in a world in which information is power. Archives could therefore become key to improve the efficiency of public management, for instance, saving time for research on public policies and supporting government decisions. Furthermore, archives can play a role in empowering social demands over the state, that is, become a channel through which people request documents on the provision of public services, for instance education, health, safety or housing, assisting the fight against corruption. More recently, we have noted that archival institutions could fulfill other roles such as provoking emotions in people by placing them before a document that would connect them to something in their life, providing critical reflection on problems of the country and society and collaborating with educational institutions, in the same direction that museums and libraries do. This new role for archival institutions would only be possible if we guaranteed access to the collection. The GLAM project was an important new way of bringing our collection to the world. One of the most viewed images released in the context of the GLAM-Wiki initiative with the Brazilian National Archives. Could you please describe how this partnership started? The partnership began with this desire to expand the access to and dissemination of the collection as I said. It was also a moment we had decided to overcome our previous state of inertia. The National Archives, until the enactment of the Archives Law (Law n. 8.159 / 1991), was responsible for preserving and organizing the documentation of the Federal Legislative and Judicial Branches. After 1991, each of these branches has gained autonomy to manage its own files. Because of this legal framework, we have become the institution responsible for preserving, for instance, the Golden Law, a document that inhabits the imagination of every Brazilian. Many employees of ours believe this is the most important document we have in our collection. Nevertheless, few people know that it is preserved by the National Archives. If you go to the Imperial Museum in Petrópolis, there is a copy, on display, but the National Archives is not mentioned. This is repeated in various institutions and textbooks. Wikipedia was not different. 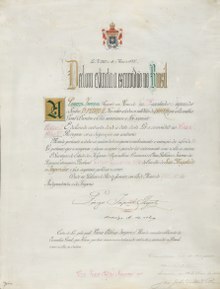 An editor had made available the Golden Law document on Wikimedia Commons from a website of Fundação Getúlio Vargas. This fact bothered us, since the reference to the National Archives was once again erased. Without knowing much of the guidelines and rules of Wikimedia projects, we decided we would make the document available in high resolution with proper metadata and use it on Wikipedia. This was rather inappropriate. Anyway, after releasing the Golden Law, we saw we could make available other important documents related to key historical events: Inconfidência Mineira, Ragamuffin War, Pernambucan revolt… It was at this point we found out about GLAM projects and got in touch to try to make this initiative more formal. This is making a long story shorter, as the key ingredient is our employees' loe for the institution and their desire to contribute as they can to the development of our society through knowledge and education. Could you please describe how this partnership evolved? Our initiative has reached a new level when we partnered up with Wikimedia in Brazil. This group reacted to our contact attempts and had experience with GLAM projects, especially with the Museu Paulista. We were delighted and decided to follow a similar path. Over time, we expanded the number of uploads and the number of access on Wikipedia to topics pertaining to the collection of the National Archives. The GLAMWiki Initiative with the Brazilian National Archives had led in December 2018 to the upload of around 9,000 files to Wikimedia Commons. Could you please describe what these files are? Firstly, we began to make available collections related to great events in Brazilian history, such as all full versions of our Constitutions and the trial of Tiradentes. The fact that these documents were provided after having gone through curation within the National Archives was extremely important so that we could get millions of access on Wikipedia in a short time. After surveying these important documents, we thought that we could provide old pictures of various cities across the country and share portraits of political personalities. Our understanding was that many entries of representatives, senators, state secretaries and first ladies had no image and we had them in our collection, especially from 1940 to 1980, in the National Agency Fund. Then, we thought that we could do the same with personalities in general, with the photos of the Correio da Manhã Fund. The latter uploads did not lead to as many views as we had had with the important documents, but it was quite gratifying to see artists from the 1940s and 1950s gaining faces and having their memory preserved. This is the function of the National Archives. After that, and motivated by the growing denial of the Military Dictatorship in the Brazilian society, we began to provide a portion of our censorship collection as well as photographs of artist and student demonstrations and subsequent repression. 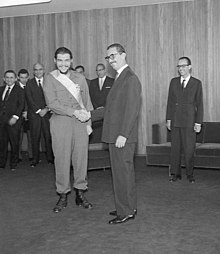 Documents on the military dictatorship, especially pictures from the Correio da Manhã Fund, depend mostly on volunteers to be described. A striking feature of this GLAMWiki Initiative is a very high rate use rate in Wikimedia projects. In December 2018, around 72% of files uploaded were used in at least one page on the projects. There were 25 million views of these files in the same month, according to the tool GLAMorgan. Why do you think this initiative has had such a wide impact? Reasons are at least threefold. Firstly, it relates to the nature of the National Archives. The institution keeps and preserves most of the documents of Brazilian history, and many of them are unique documents. Secondly, it relates to the nature of archival institutions in general. Unlike museums and libraries, which are often thematic or chronological, archival institutions hold a wide range of collections, from a wide variety of backgrounds, typologies, themes, periods, origins and places of production. There are unique public documents, but also private documents, collections donated by historically relevant personalities. Lastly, I believe the pre-curatorial done by members of the Social Media Dissemination Team of the National Archives contributed to fill quickly knowledge gaps and put files to use. Could you please describe the work flow of the GLAMWiki Initiative within the Brazilian National Archives? How many people are involved, and what do they do? We were four in the Social Media Dissemination Team, the team that was responsible for disseminating content on social media, including Wikimedia projects. In this team, two people held a master degree and two held a PhD degree. We worked primarily as collection curators, selecting documents to disseminate and elaborate texts in different languages ​​depending on social media. Instagram, for example, had a less formal language and we even tried to play some games in order to provide new experiences for our users. We worked collectively and reviewed each other's work. Unfortunately, however, our team was extinguished and incorporated into the National Archives Communications Department, which for us was a great administrative misconception, because we do not do corporate communication. We were doing collection curation and dissemination. Some social media, like Instagram and Flickr, were even framed as disseminating our collection exclusively, not corporate communications. Moreover, the number of employees working to digitize our collection was cut down by half, which has a direct impact on how much content we can share. I understand the importance of other areas of an archival institution such as document management and technical processing, but I believe that the greater the dissemination the more attention of society we will call and consequently the more public resources we will be able to get for bringing new collections in, describe and digitize them. Our team has worked on Instagram, Pinterest, Flickr, MixCloud, Twitter, Facebook and Youtube. In all of them we made the collection of the National Archives available. These platforms are different, with different presentations and proposals. Through Instagram and Facebook we were able to send images and texts about our collection to thousands of people at a single, precise moment. It is like climbing on the top of a building, releasing many leaflets and letting the wind carry them. People will be at home, going to and from work, in a doctor's office or anywhere else and receive via our social media some document from our collection in their feed and they will laugh, get excited, remember something from their childhood or simply know something they did not know. Other platforms like Wikimedia Commons and Wikipedia rely on a search form. Users find our documents when they want to search for something. As for access, we have no doubt that Wikipedia is by far the largest. We currently reach 20 to 25 million views per month, only with Wikipedia, and many of these views are students looking for entries for school work. This demonstrates just how socially important this project is. Another positive point is that with Wikimedia Commons our documents are in Google's search, which also greatly increases our visibility. Could you please describe the role Wikimedians play in the GLAMWiki Initiative with the Brazilian National Archives? They play a key role. They include content we release in entries --and we have counted content of ours in more than 90 languages! They have also contributed to improving the social service provided by the National Archives. They also act in what we call a collaborative description, which is when the user assists memory institutions in identifying people in a photo or in the transcription of documents, for example. This work has helped us a lot because our collection is huge, and to some extent our experience with Wikimedians has brought collaborative principles of Wikipedia to our work with archival curation, at the National Archives itself, improving continuously the service we offer to our society. What are your expectations for this GLAMWiki Initiative for the short and long-term? In the short term, I hope that the current directors of the National Archives will step back in their position to extinguish the Social Media Dissemination Team and reduce the number of employees that work with it, so that we can make more content available on Wikimedia Commons and other social media . My long-term expectation is that as much of the collection of the National Archives as possible is available on Wikimedia Commons, as national archives from other countries have done, including the Netherlands and the United States. Archival institutions merely preserve collections, and do not own these collections. They belong to all mankind that should be free to make use of them. And when more collections are available on the internet we are moving closer to this mission. What would you recommend for GLAMs, particularly from the Global South, which are interested in launching GLAMWiki initiatives? I recommend investing in GLAM projects and making collections available on Wikimedia Commons. We know of the financial, structural constraints. There are also fears of contributing collection in platforms that are not public. It should be noted that Wikimedia Commons has not replaced and will not replace our database and our rules of archival description. We do not see it as a permanent repository of the digitized collection, but as a great way of disseminating our collection and making these documents available on the internet. As for the resources, we may not have great investment capacity to digitize the entire collection, like the wealthiest countries, but people should know of the amazing impact our collections can have on the collection construction of knowledge. Moreover, these are collections that often only we, the countries of the Global South, have, that tell our version of history and not the version of the colonizers. If you were to choose one case that encapsulates what this GLAMWiki Initiative is all about, what case would it be? What strikes me most is the number of views. As I have said, in the National Archives many believe our most important document is the Golden Law. But Wikipedia made us realize that many other documents arise an incredible curiosity, such as the picture of Chico Buarque and Tom Jobim at the International Song Festival of 1968; the photograph of Jânio Quadros decorating Che Guevara with the Order of the Southern Cross, in 1961; a portrait of Carlos Drummond de Andrade, in 1970; a map on FEB's actions in World War II; a photograph of Indira Gandhi's visit to Brazil in 1968; the AI-5, of 1968; and a photograph of the first female electors of Brazil, of 1928. These are all documents with hundreds of thousands of views every month. As for the Golden Law now we can easily find on Google the reference to the National Archives, and via Wikimedia Commons we see one of the most important documents reach out new levels of visibility and use, including direct references in the 2018 carnival, as it was the topic of one of the parades, by Paraíso do Tuiuti. Improvement of articles related to Côte d'Ivoire. Some interesting stats were obtained: 136 articles edited, 595 edits in total by 15 editors. Wiki Labs Kultur (Wiki Labs Culture, abbreviated WLK) is the main Wikimedia-GLAM initiative in Denmark. The initiative involves Wikimedia Denmark, the National Gallery of Denmark, the Danish Art Workshops, the Hirschsprung Collection, the Danish Film Institute, AU Library Emdrup and the Copenhagen City Archives. In previous years, the initiative functioned mostly like a recurring once-a-month edit-a-thon with a focus on Danish cultural heritage, but in 2019 the events have been varied somewhat, with more of a focus on concrete Wikimedia-GLAM initiatives. The previous two events, held on February 25 and March 1, focused on mass uploading of media files and educational materials respectively. The next event will be held on March 29 at the Copenhagen City Archives from 15:00-17:00 CET and will focus on teaching new users how to edit Wikipedia. News and announcements take place in the Wiki Labs Kultur Facebook-group. A mailing list hosted on Wikimedia servers is currently being set up to provide an alternative to Facebook, but is not yet in use. Historically, Danish cultural institutions have been making their collections available on Wikimedia Commons in a variety of ways: Uploading them manually, having volunteers photograph and upload them manually, or uploading them to the cultural institution's website under a license compatible with Commons and letting others transfer them to Commons. Now, more and more institutions are interested in automated mass uploading of collections to Commons. There are various tools for this purpose available, with varying degrees of documentation. Despite several of the Wikimedians contributing to WLK having extensive technical knowledge, no one had in-depth experience with these tools. Luckily, Kim Bach was willing to put in time for picking a specific tool (the GLAMwiki Toolset), learning its ins and outs, and communicating that knowledge to everyone else. The meeting began with Kim holding a presentation on the ins and outs of how GLAMwiki works, and the various paths one can take when uploading collections to Commons. On top of the usual participants, a tech person from the National Gallery was in attendance as well. Following the presentation, discussions were had about various practical matters, as well as the needs of each specific institution in this area. A followup meeting will be held on April 26 at the Danish Film Institute. An effort to create a set of Danish Wikipedia-based educational materials suitable for use in various different contexts has been in the works for a couple of months now. The effort has been spearheaded by historian and journalist Majken Astrup, and recently Sara Stenderup Glahn has joined the project. On March 1 WLK participants met at the Black Diamond library building to discuss the details of the materials. Which age groups should be the target? What benefits do educators get from working with Wikipedia, and what are some potential pitfalls? How can the materials be useful to both educators as well as cultural institutions? The current plan is to have the materials finished and distributed sometime in mid-2020. The 19th took place the second initiation and editing workshop at the cinémathèque of Grenoble. This collaboration between the local group of Grenoble began in november 2018 in the framework and is the first action organized since city of Grenoble and Wikimédia France have discussed about opportunities of collaboration (a partnership was signed in october 2018). The workshop was based on the provision of a great film fund and the work of 8 attendees. On the 16th of February 13 regional coordinators had their first 2019 meeting to share their experiences and feel part of the organization. Susanna Giaccai, Alessandro Marchetti, Manuela Musco, Camillo Pellizzari organized an edit-a-thon for Wikimedia Commons and Wikidata for cultural heritage in Pontedera (Tuscany) on February, the 19th. tweet and post. It is the first course where an integrated wikidata-commons approach is taught on wikipedia. Librarians came mostly for the provinces of Lucca and Pisa, and revised and improved items from San Vincenzo and Palaia. The collaboration between Foundation Edmund Mach and Wikimedia Italia, started in 2013, has reached its third chapter. This year the project "Protagonisti della nostra storia" coordinated by the Foundation's Library involves the students of class 3 VE of Istituto Agrario of San Michele all'Adige (TN). In order to celebrate the 145th anniversary of the foundation they are writing some biographical articles about significant people of their institute. On February 21st the Wikipedian and WMI member Francesco Serra held a practical lesson in the computer lab explaning how to contribute to Wikipedia with a particular focus on writing and organizing the content of an article. We wish the students good luck with their work! BEIC (Biblioteca europea di informazione e cultura) and Wikimedia Italia renewed their collaboration for the fifth year in 2019. The GLAM-BEIC project started in 2014 and is the longest-running GLAM-wiki project in Italy. Marco Chemello is the wikipedian in residence in 2019 too. From February 1 to 28 we had the Wiki Loves Mexico contest organized by Wikimedia Mexico and the Secretariat of Culture of Mexico centered on the visual documentation of the great diversity of festive, cultural and popular expressions of our country, recognized by UNESCO as one of the world's largest holders of intangible heritage and of which there are very few photographs on Wikimedia Commons. The contest received until February 28 an estimated 3747 photographs which will be evaluated in the next month. With the permanent support of the national cultural organism, we launched the contest that received the most diverse samples of both documentary photos and talented records of the Mexican festive reality. From the November celebrations of the Xantolo in Veracruz, through numerous documentation of the textile wealth of our country to the numerous musical manifestations as the most diverse masks, facial paintings, costumes and typical costumes. Following the tour of the National Mexican Museums projects we had on February 16, 2019 the first Editathon at the National Museum of History (in Spanish: Museo Nacional de Historia), one of the most visited museums in our country placed at the historical Chapultepec Castle, a XVIII century building and shaped as an European castle on the top of the Cricket's hill and one of the most recognizable points at the city's skyline. The event centered around the edition about the lack of contents on Spanish Wikipedia about the collections of the museum, specifically all the murals that are placed in all the spaces of the museum made by notable Mexican authors like David Alfaro Siqueiros, José Clemente Orozco, Juan O'Gorman and Jorge González Camarena, among others. The museum have more than 60 000 pieces so they have a Research Department devoted to the study and conservation of that collections with a variety of profiles. During the editathon we had the (so kind) presence of relevant female researchers of the museum of this department that supported us around state-of-the art sources, gaps to cover also they by itself collaborated writing new articles and completing others. In addition some wikimedians had a special tour in the surroundings of the hill that are not open to the public and has historical vestiges such as the foundational stones of the castle itself, Mexica petroglyphs and the stone staircase called "Escalera de Carlota", remembering the ordenance given by Carlota of Mexico to build this access. For us Wikipedia is a space which we know that the people and moreover the youth goes frequently to consult information. So that was our main reason to have an editathon, we believe the museum can support with reliable information of our collections from experts. Usually this knowledge does not have an exit to the public more than the own social media accounts of the institution"
The National Mexican Museums is a project allied with the Secretariat of Culture of Mexico which is intended to have Wikimedia activities at five national museums like training to researchers and editathons. Simultaneously to the editathon we had the Art and Feminism 2019 training at the University Museum of Contemporary Art of the National Autonomous University of Mexico (in Spanish: Museo Universitario Arte Contemporáneo). The workshop of Wikipedia and Wikidata basics was aiming to the fourth Art and Feminism editatona which was realized on March 2, 2019 in the same venue. The workshop was attended by 40 persons. As a part of the revamp of the CC Network in the world, on January 31 a new chapter was launched in Mexico formed by diverse free knowledge activists including Wikimedia Mexico members. The presentation event was held at Laboratorio de Tecnologías El Rule in Mexico City. On Thursday January 3rd The KB - National Library of the Netherlands and Creative Commons Netherlands organized with the support of the National Archives of the Netherlands and Wikimedia Nederland a day full of lectures focusing on works by famous artists, writers and artists who died in 1948. On Saturday January 26nd the first writing session of 2019 for Wiki goes Caribbean (WGC) took place in the National Archives of the Netherlands in The Hague. The theme was 'Photo, video and sound'. A number of the twelve new Wikipedians uploaded images to Wikimedia Commons and added images, videos and sound fragments to articles on Wikipedia. Others looked for documents and books in the National Archives of the Netherlands and continued writing articles on Dutch or English Wikipedia. This year, the WGC writing afternoons take place every month in the National Archives of the Netherlands. For the third year in a row the Gendergap working group in cooperation with Atria Institute on gender equality and women's history organizes a monthly ‘WikiVrijdag’. Every 4th Friday of the month we meet in the library of Atria in Amsterdam to work on a theme. Two Wikimedians in Residence (WIR) joined the Academic Heritage Foundation in January 2019 for the Wiki Scientists project. Over the next six months they will work on the project to make the biographical data of Dutch professors and leading scientists available on Wikidata in a structured way. The WIRs will support the eleven affiliated universities to collect and process the biographical data on this platform. On Wikidata, a Wikiwetenschappers project page has been created where you can read more (in Dutch) about the progress of the project. In collaboration with a contemporary art museum - the Museum of Art in Lodz - and one grassroots group of activists, the Criatid Collective (kolektyw Kariatyda), two Art+Feminism edit-a-thons will take place later this month in Wrocław and Łódź. On the 23rd of February, a pre-editathon training meetup was run by Celina Strzelecka (WMPL) in Wrocław. The meeting was organised by the Cariatid Collective and Wikimedia Polska. During the first meeting the participants learned how to upload files to Wikimedia Commons and the basics of editing an article. The second meeting - an editathin - is planned for the 16th of March at Recepcja, Ruska 46c in Wrocław. The event will be held between 10AM and 6PM. Everyone is invited. The event will be devoted to editing and writing new articles about women artists. More information can be found on a dedicated page. Meanwhile the Museum of Art in Łódź will host a two-day event for a second time running (in 2018 it was initiated by a local activist and scholar Alicja Kujawska). The organisers are planning to edit articles about people excluded from the mainstream narratives of history and culture. The edit-a-thon will take place on the 30th and 31st of March (Saturday-Sunday) at MS1 museum, Więckowskiego 36 in Łódź, from 11AM to 5PM. The first day will be filled with tutorials and learning how to edit and uplaod images, and on the second day the participants will publish their new articles in Wikipedia. More information on the wikiproject. Anyone visiting the city, or any Wikipedia editor from abroad is welcome to drop us a line and jin the group for a Skype call and a remote edit! Email us at kultura@wikimedia.pl. Interestingly, both Wiki editathons are organised on the request of local communities and women's groups, which proves that the Art+Feminism global initiative is capturing imaginations and inspiring the creation of publicly accessible knowledge. The end of traditional Carnival period inspired the Regional Institute of Culture in Katowice to share via Wikimedia Commons a collection of over 300 photographs collected by the Institute photographer and documenting a number of local rituals performed every year in the Silesian towns and villages. The RIK is collaborating with Wikimedia Polska and whenever possible, is sharing its ethnographic and architectural documentation on CC BY-SA license. Among the Institute's activities an important are is to conduct ethnographic field documentation in rural areas of the Silesian and Opolskie Voivodeships. Among the rituals the most prominently featured in the set is bear guiding (the English language article is waiting for you! ), Barbórka, as well as other seasonal traditions. The entire collection can be found in the Wikimedia Commons category Traditions of Silesia - take a look and illustrate related articles!. The Mazovian Digital Library is a new partnership which began in December 2018. Our Partners at the MBC have selected a set of 1400 digitised engravings from the public domain presenting historical figures from XVIIIth and XIXth-century Poland: actors and actresses, politicians, scientists, historians, cultural entrepreneurs, activists and others. This valuable collection brings into light many figures who have been important to their local communities and contributed considerable accomplishments to society, but whose memory has often been forgotten. The uploaded portraits are an inspiration for Wikipedians to expand or write new biographical articles and bring these accomplished people back into the light. The global reference editing campaign #1Lib1Ref has placed Serbia at the top of wiki communities that have added the highest number of references. A total of 28 editors of Serbian Wikipedia added 1672 missing references! The absolute winner of this action is the user Vanilica, who added 653 references, which placed him in second place in the world! The second best participant in Serbia, the user Ziva73 added 252 references, followed by user Ojce with 189 entries, Draganapopovic with 107, and user BuhaM who added exactly 100 references. Wikimedia Serbia awarded these five editors with vouchers for the purchase of books, but other participants were awarded as well, with goodie bags, and fine catering organized at the University Library. The most active participants were librarians from Belgrade City Library and University Library “Svetozar Marković”, where two workshops, and final event were held. After joining the GLAM program during the residence in the Museum of Yugoslavia and donation of 50 images, the Museum of Science and Technology is now hosting the Wikipedian in residence for two months. Teodora Lukić, an experienced Wikipedian will upload more than 500 images, digitize 2 books, write around 20 articles on Serbian Wikipedia and organize one edit-a-thon for Museum staff. Images uploaded until now, showed us some fun products from history, like tin toys, vacuum cleaners, jukebox, coffee machines, first orthotic arm and (still working) organs. Articles written so far, also show us some very interesting stories, like the Zero-Moment Point Theory or Belgrade hand - the first bionic hand in the world. The residence will end March 31st. Manual washing machine from 1920. Apart from the ongoing work with the National Library of Sweden (to bring more library data to Wikidata) Wikimedia Sweden have also received funding for a project together with the Regional Library Association. Starting now and working together until September 2019 we will create a digital learning platform to teach librarians about the Wikipedia and Wikimedia parts of digital literacy, run #1lib1ref, crowdsource library data (about the institutions) to Wikidata. As a head start Axel Pettersson did a presentation for almost 100 librarians in Örebro as part of an inspirational training day. Unknown actor, Hildur Engström and Julia Caesar in the revue Hertiginnan av Danviken at Kristallsalongen 1906. Photograph 1906 by Anton Blomberg (1862–1936), Scanned glass negative, Swedish Performing Arts Agency, Public Domain. When GLAMs upload media to Wikimedia Commons and volunteers add and correct the metadata, the information is rarely read back to the originating institution. Now that Structured Data for Commons is making editing and reading metadata much easier, it can be expected that there will be many more apps and tools to play around with and enrich the openly available media. The institutions will be able to take advantage of the cumulated knowledge, with new tools to read that data back to the intitutions’ own collection systems alongside their own data. This is what we call data roundtripping. The Wikimedia Commons Data Roundtripping project run by the Swedish National Heritage Board is working with GLAMs to identify the needs and desires regarding user contributions in their content, as well as barriers to making use of them. A survey among 38 respondent GLAM representatives revealed that user contributed data is still modestly adopted by the organisations. There are no established technological means to tackle the challenge. User contributions that are adopted, are usually gathered in the most traditional ways, by individual feedback by phone or mail. Trust and verifiability of the contributions were mentioned most often as barriers to incorporating the input into the institution’s own data. The research also looked at how institutions are taking advantage of authority data as a way of linking across collections, and whether Wikimedia projects could leverage that capacity. The Wikimedia Commons Data Roundtripping project will prototype a tool that addresses these three issues. Each functionality of the tool is developed in collaboration with a museum. Swedish Performing Arts Agency's pilot is created around an upload of 1200 glassplate photographs. Earlier they have translated all descriptions of images into English before uploading them to Wikimedia Commons. In the pilot the images will be uploaded with Swedish descriptions only. They are translated in a translation campaign and the translations are fed back to Swedish Performing Arts Agency's collections management system. The purpose of the pilot with Nationalmuseum is to take advantage of authority IDs that have been added to the institution's contributions in Wikidata by the users. The institution is interested in collecting the Wikidata IDs themselves and ULAN IDs found in the Wikidata entries. This will aid Nationalmuseum to get additional information about artists in their collections. The topic of The Nordic Museum’s pilot is to record metadata of the imagery from their exhibition about British fashion. The audience is invited to describe the exhibition pieces in a description campaign. This enriched information is ingested into The Nordic Museum’s collections management system as multilingual Wikidata tags. The Belgian organization Packed/VIAA will contribute several GLAM pilot projects to demonstrate how Structured Data on Commons can work for various types of cultural collections: a typical museum collection, a photographic archive, and more. In March 2019, Packed works on a pilot for a complex collection of decorative arts, which can serve as an example on how to describe many different kinds of decorative objects from GLAM collections. The pilot project also explores how different types of collections of decorative arts, from different institutions, can relate to each other on Wikidata and Wikimedia Commons. Olivier van D'huynslager (User:Oliviervd) extensively describes the Philippe and Marcel Wolfers collection on Wikidata this month. Louis Wolfers (1820-1892), his son Philippe Wolfers (1858-1929) and grandson Marcel Wolfers (1886-1976) were part of a family of prominent Belgian silversmiths and designers of decorative arts - jewellery, sculpture and other decorative items. Some of the objects they have designed are in Belgian and international museum collections; their company's archive and many design sketches have been preserved as well. Olivier's work in March focuses, among other things, on describing all these individual items on Wikidata, and interrelating them correctly. Later this year, images related to these collections will be described in structured data format on Wikimedia Commons, and this pilot project will be used as the basis for new documentation on data modelling for structured data as well. Don't forget to check out this month's Special Story in This Month in GLAM: it describes progress of a project by the Swedish National Heritage Board to investigate how cultural institutions can retrieve back improved metadata from their files on Wikimedia Commons. The Program Design for Wikimania 2019 is live! Please note that it is possible to apply for a scholarship (open till March 15) and there is a call for program Spaces and Leaders (open till March 22). If you think that GLAM-Wiki should be represented in the program, please consider applying for the latter! This page was last edited on 8 March 2019, at 07:52.